12:52pm: The Phillies are sending $1MM to the Dodgers as a part of the deal, an industry source tells Todd Zolecki of MLB.com (on Twitter). 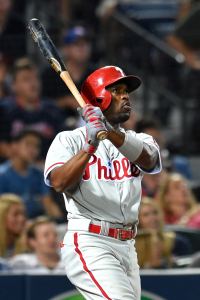 10:27am: After more than a week of anticipation, the Phillies announced that they have traded shortstop Jimmy Rollins and cash considerations to the Dodgers in exchange for right-hander Zach Eflin and left-hander Tom Windle. There was a significant hold-up in the trade, as the Phillies had to wait for the Dodgers to finalize their Matt Kemp trade with San Diego due to the fact that Eflin was part of the Dodgers’ return in that deal. Kemp’s physical dragged out the process for both trades, but each has now been announced. After losing Hanley Ramirez to the Red Sox in free agency, Los Angeles filled its vacancy at shortstop with another high-profile veteran. Rollins actually generated more fWAR (3.6 to 3.4) than Ramirez in 2014, as while Ramirez delivered more at the plate, Rollins far outpaced Ramirez defensively. Rollins is no longer the offensive force that he was in his prime, but he still posted an above-average 102 wRC+ in 2014, hitting .243/.323/.394 with 17 homers and 28 steals over 609 plate appearances. Rollins reached a vesting option in his previous contract that earned him an extra year and an $11MM salary for the 2015 season. Since the Dodgers’ commitments to both Rollins and third baseman Juan Uribe will be up after 2015, that allows the club some flexibility in deciding the future of Corey Seager. The top prospect is a shortstop now but many project him to eventually require a move to third base. Rollins, 36, spent his entire 15-year career in Philadelphia, with the highlights including the NL MVP Award in 2007 and a World Series title in 2008. Rollins is the Phillies’ all-time franchise leader in hits and doubles, and only Mike Schmidt played more games in a Phillie uniform. Though parting with Rollins is bittersweet for Philadelphia, they’ll receive a pair of solid pitching prospects in return. Eflin, 20, was selected 33rd overall in the 2012 draft, and the 22-year-old Windle went 56th overall just a year later. At the time of the Kemp deal, ESPN’s Keith Law wrote (subscription required) that he felt Eflin was “at worst” a fourth starter in the Majors with the potential to become more. Baseball America ranked him 14th among Padres prospects last offseason, and MLB.com already ranks him fifth among Phillies prospects, calling him a potential mid-rotation workhorse with the build of a prototypical right-hander. BA noted in their scouting report that he sits comfortably at 90 to 92 mph with a sinking fastball but as touched the mid-90s in the past when needed. Eflin pitched to a 3.80 ERA with 6.5 K/9 and 2.2 BB/9 in 128 innings at Class-A Advanced last season. Windle, drafted out of the University of Minnesota, also spent last season in High-A, compiling a 4.26 ERA with 7.2 K/9 and 2.8 BB/9 in 139 1/3 innings. BA ranked him 12th among Dodgers prospects a season ago, and MLB.com has him sixth among current Phillies farmhands. His changeup made serious progress in 2014, per MLB.com, giving him a chance at a solid third pitch to pair with a low-90s fastball and a “nasty” slider. BA feels that his slider a plus pitch that can befuddle both right- and left-handed batters, noting that even if he doesn’t pan out as a starter, Windle’s fastball/slider combo could play well in a high-leverage relief role. At the time the trade was reported, Law noted that Windle pitched in a brutal environment for pitchers last season, adding that he liked Windle’s chances to break out as a prospect in the Double-A Eastern League in 2015. CSN Philly’s Jim Salisbury first reported the Rollins to the Dodgers was a done deal. Ken Rosenthal of FOX Sports indicated, on Twitter, that Eflin would head to the Dodgers, and Salisbury reported (also on Twitter) that Windle was the other player in the deal.